When Intel had to improve its silicon product and alleviate the problems one of the functional groups was having, they turned to Scrum. The team that they were having problems with were responsible for providing the test collateral to support cost-effective device screening and classification. Essentially, this is the group working between the designers and the factory manufacturers that couldn’t keep up with the tremendous pressure of translating design to mass production. Long story short, Intel determined that Agile project management was the key to alleviating the pressure and streamlining the workflow—with Scrum as the main method. Their large-scale transformational change covered 50 people and several Scrum teams that were scaled to the project. They have a strong definition of what is done. Since they have actual units to test and use, they were able to write good stories and acceptance criteria that helped everyone pace their work and determine whether they were meeting the standards that both the design team and the factory manufacturers needed. A great technique they implemented was ‘Pair Review’, where you needed a team member and a stakeholder to agree whether acceptance criteria were met in a story. No partial credit given for unfinished work. They considered work ‘done’ or ‘not done’, so everyone strove to finish sprints so they wouldn’t be held accountable for delaying the project. Only 100% delivery was accepted. Nine-day sprints. Instead of the weekend being spent stressed over planning or review, they were spent relaxing and recharging. This improved the morale and the quality of life drastically. Every other weekend could be used for work with the other weekends delegated to resting. This is their version of sustainable pace and is actually a very good standard to adhere to. Tasks are designed to take less than a day. Intel wasn’t afraid to go smaller and smaller with tasking as long as they contributed to an overarching User Story. This way, it was very easy to spot whether a person was impeded since an unfinished task at the end of the day was a good indication of an issue. Burndown on the Daily Scrum. Intel found out that visual representation of the remaining tasks during the Daily Scrum made the meetings more productive and helped disseminate information. Everyone knew exactly where everything was so they know how to perform for the rest of the day. Executive sponsorship is the key to success. I’ve been saying this over and over again to anyone who asks; without the full support from the executive level, it’s better not to implement Scrum or any Agile project management method at all. Half-baked attempts are going to get half-baked results that lead nowhere and cost more money. Think of a transformational change to Scrum or Agile project management a long-term investment that benefits all the levels of the business and ultimately delivers value and cuts costs. In conclusion, Intel’s story tells us that shorter increments and constant inspection and adaptation are the heart of Scrum. From short iterations, the team slides into the Agile Mindset since they are forced to review and improve in such short cycles. Sticking to your roles but collaborating intensely is important to keep the transparency and the acceptance criteria. 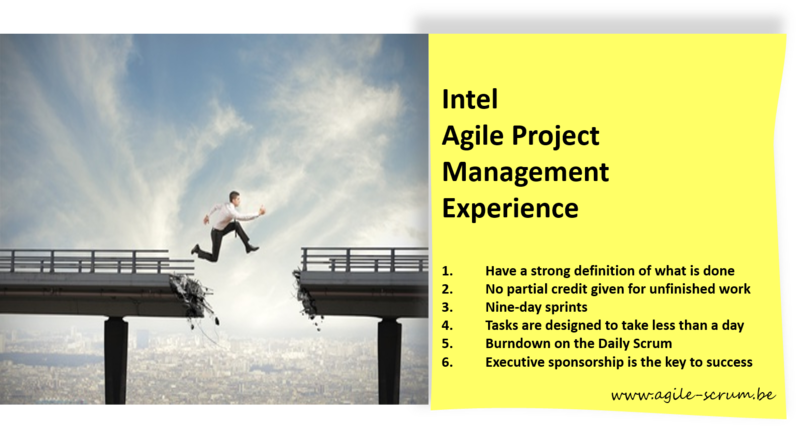 Keep in mind that if you want to replicate the practices that Intel performs and get the same results, you should engage an expert in Agile Project Development and start training your employees in the new approach.